A selloff in Chinese tech stocks isn't affecting U.S. FANG ETFs. 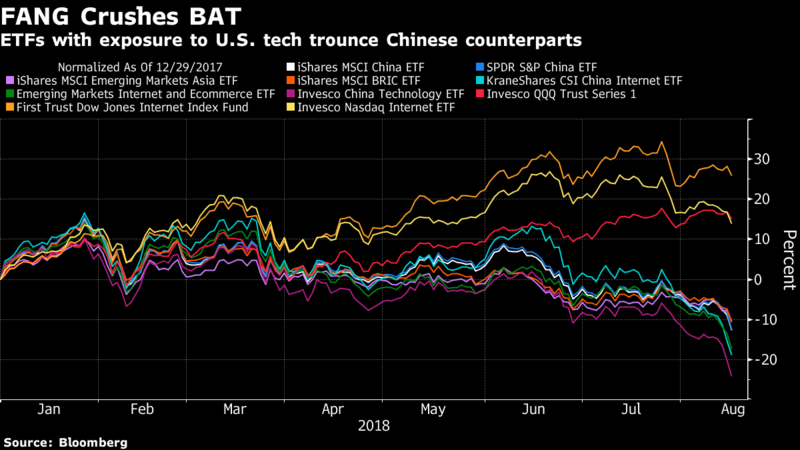 (Bloomberg) --Some investors in exchange-traded funds are absorbing a hard lesson about the underperformance of Chinese tech stocks compared with their U.S. peers. A disappointing earnings report from Tencent Holdings Ltd. sparked a severe selloff in Chinese tech stocks on Wednesday. That’s sent products with significant exposure to the BAT trio -- China’s equivalent of the U.S. FANG quartet -- plummeting. Seven U.S.-listed ETFs with at least $200 million in assets and a 13 percent cumulative weighting toward Baidu, Alibaba and Tencent are down double digits this year. Meanwhile, funds with disproportionate exposure to the FANG stocks are up big in 2018 despite also getting knocked on Wednesday. The Invesco QQQ Trust Series 1, which tracks the Nasdaq 100 Index, saw its year-to-date outperformance of the Invesco China Technology ETF swell to nearly 40 percentage points. Fund managers surveyed by Bank of America Merrill Lynch in August judged long positions in U.S. and Chinese tech behemoths to be the most crowded trade for the seventh month running. Tech industry leaders in each of the world’s two largest economies are considered structural growth stories, with near monopolistic characteristics in some cases. But the price action in 2018 suggests the two groups shouldn’t be mentioned in the same breath.